KODAK, TN – For the 24th year running, Friends of the Smokies, an official nonprofit partner of the National Park Service, will host the Friends Across the Mountains Telethon to raise money for Great Smoky Mountains National Park (GSMNP). 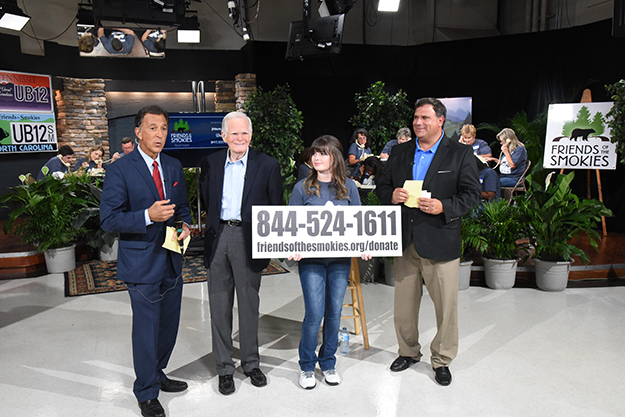 This year’s Friends Across the Mountains Telethon will be broadcast live on WBIR Channel 10 in Knoxville and WLOS News 13 in Asheville on Wednesday, August 15th from 7:00 p.m. to 8:00 p.m. The program will be shown commercial-free thanks to generous support from sponsors Dollywood, Mast General Store, Pilot Flying J, and SmartBank. Last year, Friends of the Smokies collected $208,321 over the phone during the broadcast and online at FriendsOfTheSmokies.org/donate. Since 1995, this special event has raised more than $3.7 million to support GSMNP. Friends of the Smokies provides the park with more than $1 million in annual support to fund critical projects and programs in the National Park including preservation of historic structures, wildlife management and research, and environmental education for local schoolchildren. Donations collected Wednesday night will be used towards Friends of the Smokies’ 25th Anniversary Signature Project: a capital campaign to upgrade the park’s emergency radio communications system. The $2.5 million effort will leverage $1.25 million in federal funds and grants to match every donation made to Friends of the Smokies. The state-of-the-art radio upgrades will allow rangers to respond more quickly and effectively to emergency situations in the park, keep more than 11 million annual visitors safe, and communicate with emergency services in surrounding communities. Matching telethon donations can be made online now at FriendsOfTheSmokies.org/donate or by calling the Tennessee office of Friends of the Smokies at 800-845-5665 or the North Carolina office at 828-452-0720. During Wednesday’s broadcast, supporters can call toll-free 844-524-1611 to make a donation. Friends of the Smokies is an official nonprofit partner of Great Smoky Mountains National Park and has raised $62 million to support critical park programs and maintain the Smokies as a crown jewel of the National Park Service. Discover and donate at FriendsOfTheSmokies.org.